Idukki district is one of the nature rich district of Kerala. The main attractions in Idukki are plantation tours, elephant rides, boat cruise, trekking and so on. In this article I have mentioned the top tourist destination in Idukki. Read below so that you will not miss any during your visit to Idukki. Idukki is the second largest district in Kerala which shares its borders with Pathanamthitta, Kottayam and Ernakulam districts. Idukki is the best tourist destination in Kerala as this district is been blessed with wild reserve and natural beauty. Here I have mentioned the main tourist attraction in Idukki district. Munanr, th emost attractive hill station in Kerala is a place where three streams merges with each other. The three mountain streams are Mudrapuzha, Nallathanni and Kundala. It is very cold place and is rightly known as the Switzerland in Kerala. “Neelakurinji” is a flower which is seen on the hill stations of Munnar and this flower blossoms only once in every 12 years. 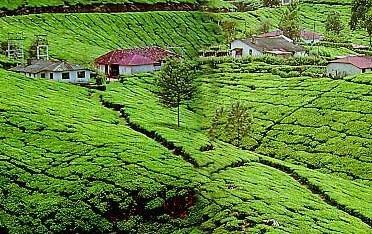 Munanr has lot of tea plantations and the famous Kannan Devan Tea factory is in this place. The highest peak in South India, Anamudi is also in Munnar. This is a place worth visiting. Idukki Arch Dam is a dam constructed across the Kuravan(839 meters) and Kurathi(925 meters) mountains. It is the first arch dam in Asia and is the world’s second arch dam. This is a very good picnic spot as the Kulamavu Dam and Idukki Wildlife Sanctuary are located very close to the Idukki Arch Dam. The height of this dam is 550 feet high and is 650 feet in width. This dam is been constructed and is owned by the Kerala State Electricity Board. The underground Power House is located at Moolamattom. This dam is used to generate electricity water from this dam is used for irrigation purpose and above all it is a well noted tourist destination as well. Devikulam is another picnic spot which is only 7Kms away from Munnar. It is believed that Sita Devi, wife of Lord Rama took bath in a nearby water body and hence the name Devikulam. The water body is called Sita Devi Lake. This lake is ideal for using water transport and for trout fishing. Thumpachi Calveri Samuchayam is another famous picnic spot in Idukki district. The view of sunset from this particular place is very nice. Mainly people approach this place for relaxation as Calvary mount has a calm and quite atmosphere. It is a eco-tourism destination. From the top of the mount, we can see the hills, Idukki reservoir and valleys. It is an amazing site. Climbing the mount itself is an adventurous thing. Periyar National Park and Wildlife Sanctuary (PNP) is often known by the name Thekkady. The forest in Thekkady one of the greatest reserve of wildlife in Kerala. In 1978, the Periyar National Park was declared as a Tiger Reserve. Another attraction at Periyar is the group of elephants that plays at the lake. That is a wonderful sight. The main animals seen here are elephants, tigers, monkeys, bears etc. Observing these animals from a distance is quite an interesting thing for nature lovers. Idukki Wildlife Sanctuary extends over the Thodupuzha and Udumpanchola taluks of Idukki district. The common types of animals found in the Idukki Wildlife Sanctuary are elephants, deers, porcupine, Giant Squirrels, boar and so on. It also has snakes like Cobra and many other non-poisonous snakes. Peafoul, Black bulbul, King fisher, Myna etc can also be seen there. Chinnar Wildlife Sanctuary is located in Devikualm taluk of Idukki district. It was declared as a wildlife sanctuary in 1984. Chinnar has the unique shrub forest with Xerophytic species. The endangered species, endangered Giant Grizzled Squirell are seen here at Chinnar. Nadukani is an attractive hillstation in Idukki district. The view from the top of this hill station is amazing and we get to see the blue mountains touching the sky in the north side. The name “Nadukani” itself implies “to see the country”. Nadukani is an easily accessible picnic spot in Idukki compared to others. It is better to visit this spot during the day times especially when it is sunny. Vagamon is another charming hill station located in Idukki district. It is very close to Kottayam district. This place too have a very cool atmosphere hence best suited for picnics and relaxation. Vagamon is filled with natural beauty and has lakes, trees and grass everywhere. The major attractions here are boat cruise, horse ride and so on.